Printed with permission from Shauna Sever from the book Pure Vanilla (it's a must have for your bookshelf), we have made these cookies 3 times in the last month. Adapting them to be dairy-free for my son, he's proclaimed them to be a new favorite, as... well, I hate to admit this, he's not really a chocolate fan. 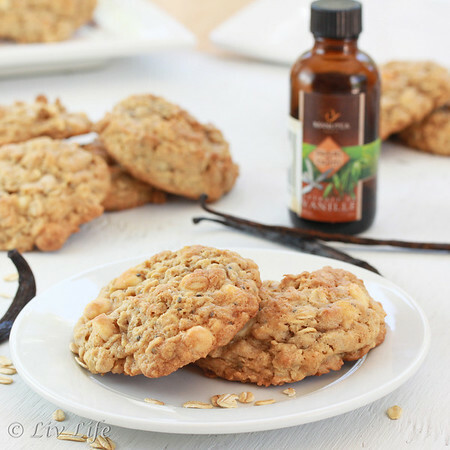 Filled with wholesome oatmeal and the essence of vanilla, these cookies are a keeper. Position racks in the upper and lower thirds of the oven and preheat to 350ºF. Line 2 baking sheets wtih parchment paper or silicone baking mats. In a large bowl, whisk together the oats, flour, baking soda and salt to blend well. In the bowl of a stand mixer fitted with the paddle attachment, beat the butter and vanilla extract on medium-high speed until blended and creamy. Add sugars and beat until light and fluffy, about 2 minutes. Beat in eggs 1 at a time. 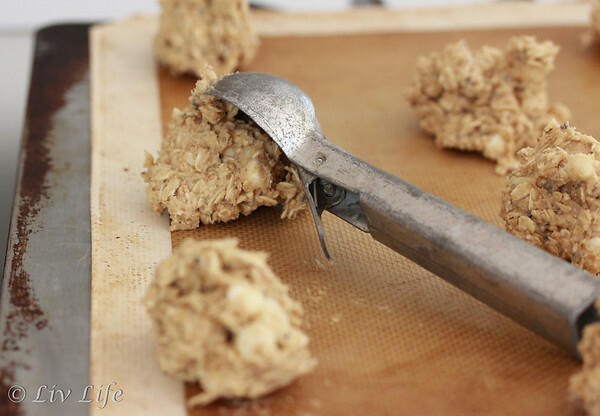 Reduce the mixer speed to low and gradually add the oat mixture, then the white chocolate. Scoop the batter, 2 Tbs at a time onto the prepared baking sheets. Sprinkle a bit of the vanilla fleur de sel onto each cookie. Bake until the cookies are golden around the edges but still a bit soft in the centers, 12-14 minutes, rotating sheets from front to back and top to bottom halfway through the baking. Do not overbake. Let the cookies cool on sheets for 2 minutes and then transfer to a wire rack to cool competely. Liv Life Note: ~By accident I added 1/2 tsp of baking powder - mixed it up for the baking soda. The cookies turned out beautifully, so I thought I'd mention that I had added it to my version. ~The only other changes we made to the recipe were to use the Earth Balance Sticks to omit the dairy, and we didn't salt the tops of the cookies, though someday I'm going to have my own Vanilla Fleur de Sel (Shauna talks all about it in her book!). And once we added 2 Tbs of chia seeds... just because they were there. We liked them. Have you ever seen a Canada Goose?? These beauties live just down the road from Christiane and she sent me this shot after I told her I'd never seen one. 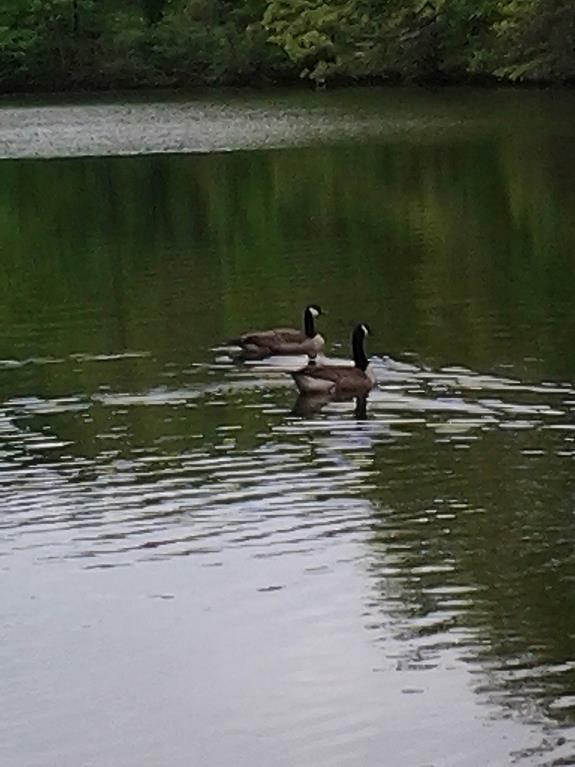 They look peaceful, but I hear they can give quite a honk if irritated with one another. These look FABULOUS, Kim!! Give me an oatmeal cookie any day of the week, and with the white chocolate chunks...oh my! I know I already wished it, but can't help but say it again, Happy Mother's Day! These look DELISH, Kim! I'm not a fan of white chocolate (I prefer real chocolate) so I might substitute it and see what happens :-) Thanks for sharing the recipe. Kim, these look AMAZING!! I happen to know a couple of little kiddos who would go crazy over these delicious goodies! Yum! And Happy Mother's Day my dear friend! These look amazing. I have borrowed Pure Vanilla from the library a couple of time which is always a good indicator that I need to buy this book, so it is now at the top of my wish list. The lady who doesn't like chocolate. I like that. :) Can you see me smiling from ear to ear? I actually showed up here because I want to make your limoncello lemon cake and just about passed out when I saw those cookies. I am so making these today. Well, probably as soon as I stop typing. These look awesome!! I hope you had a great Mother's day!! I love Christiane's site so I will have to check out Jean's. These cookies look delicious! 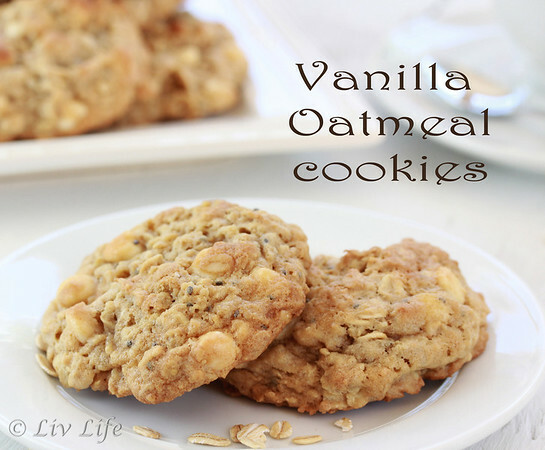 These look so delicious and I love the sound of the white chocolate, oatmeal and vanilla combination! Approximately how many cookies does this recipe make? So excited to try it.